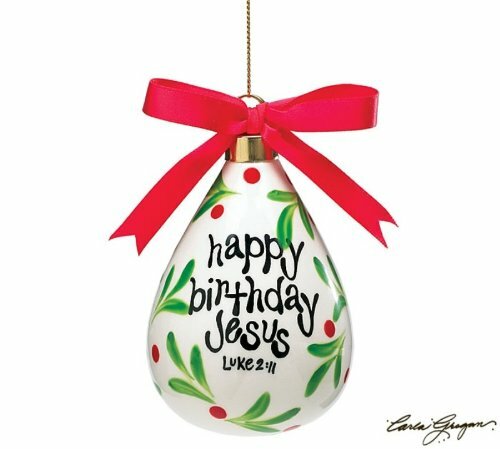 Decorate your Christmas tree with ornaments that tell the real reason for the holy day -- the birth of the Savior, Jesus Christ. It might be a cliche, but Jesus is the reason for the season! The very word Christmas comes from "Mass of Christ," when the birth of Jesus was remembered and honored. Although modern Christmas celebrations are often devoid of that sacred signifigance, the original meaning of Christmas is essentially the birthday of Jesus. 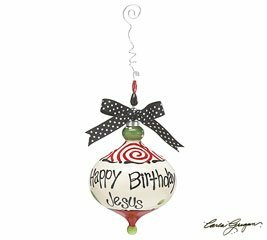 Keep the focus on Jesus with Happy Birthday, Jesus Christmas ornaments for your Christmas tree. This ornament features a modern take on a traditional Christmas ornament shape. 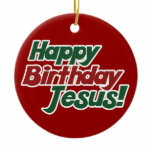 Bold colors and dotted ribbon add to the appeal of a simple font saying, "Happy Birthday Jesus." A twisted silver wire adorned with colorful beads forms the hanger. This ornament is both quirky & fun. But it is reverent at the same time. There are many stories about the tradition of candy canes at Christmas time. But it is generally held that the shape of the candy cane represents a shepherd's staff. Remember that shepherds were watching their flocks the night Jesus was born in Bethlehem. Angels appeared to them and told them to go see the baby wrapped in swaddling clothes. The shepherds did find Jesus and worship him. 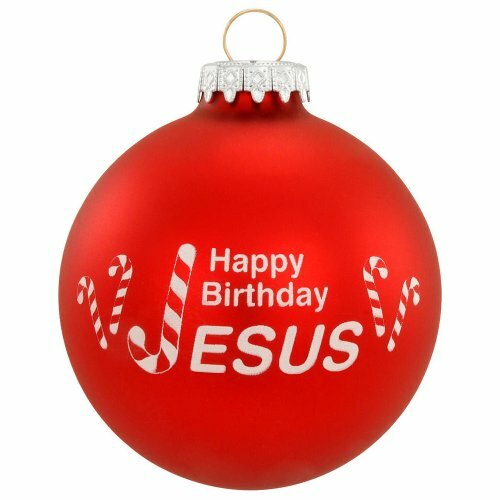 This lovely red ornament wishes Jesus a happy birthday on one side while recounting the tradition of the candy cane on the back. These simple ornaments are flat discs to adorn your Christmas tree. Their simple appearance hides a deep truth -- Christmas is Jesus' birthday! 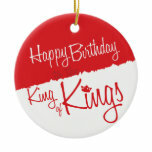 Give honor to Jesus with these ornaments from Zazzle. Luke 2:11 says (in the NIV) "Today in the town of David a Savior has been born to you; he is the Messiah, the Lord." That captures the essense of Christmas -- recognition of Jesus as Savior. 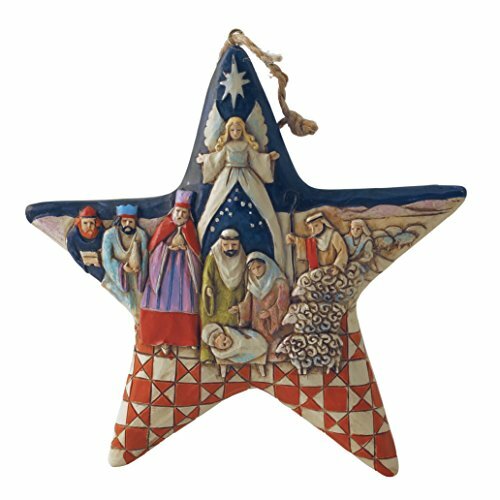 This gorgeous ceramic ornament reminds us of the meaning of the holiday -- literally "holy day" -- with whimsical text on a white background. Red and gree embellishments finish off the simple style of this special decoration. 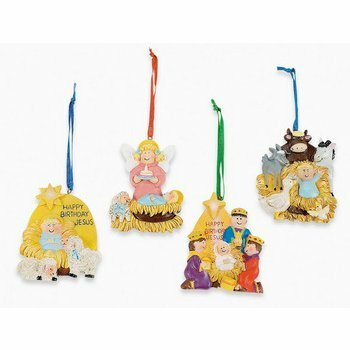 The ornaments and ornament sets below honor Christ's birthday with scenes from the nativity. Whether you prefer a more whimsical style or a more realistic style, the selections below are clear about the reason for Christmas -- Jesus' birth in a lowly manger over 2000 years ago. Although the wise men came to visit the child Jesus a few years later, not the infant Jesus, they are often portrayed along with Mary, Joseph, and the shepherds at the manger scene. 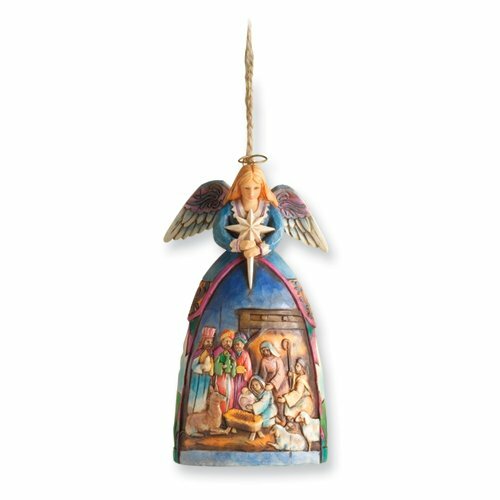 Don't allow that inconsistency to turn you away from these nativity ornaments. The magi did come and present gifts to Jesus. Putting them at the manger simply abbreviates the narrative into a single scene that is easy to portray. 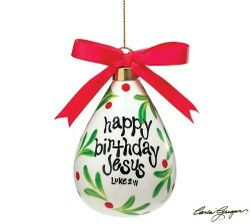 Making your own customized ornament to celebrate Jesus' birthday is a great Christmas activity. Remember that your children and grandchildren probably won't remember the gifts you bought them for Christmas this year. But they will likely remember the holiday traditions your established and faithfully observed year after year. 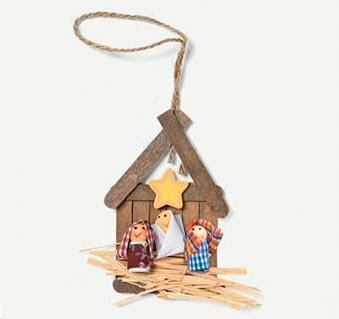 Start a crafty tradition with these easy to assemble nativity ornament kits. All you need is here. Add on the words "Happy Birthday, Jesus" to make it perfect. Let the children decorate for Christmas with these crafty centerpiece ideas that are easy and inexpensive. Make it a family tradition to create rather than buy your centerpiece. If your home is tiny and you don't have a fireplace mantle, there are some unique and creative ways to hang your Christmas stockings so they can be enjoyed all season long. Make a sweet Christmas with a cupcake themed tree this year. Cupcake ornaments are pretty and make appropriate gifts for the sweeties in your life. Decorate your Christmas tree in traditional red and white with peppermint themed ornaments. Lovely ornaments, Jimmie. It is so important to keep our focus on what Christmas is really about.